A synthesizer like you've never heard before. 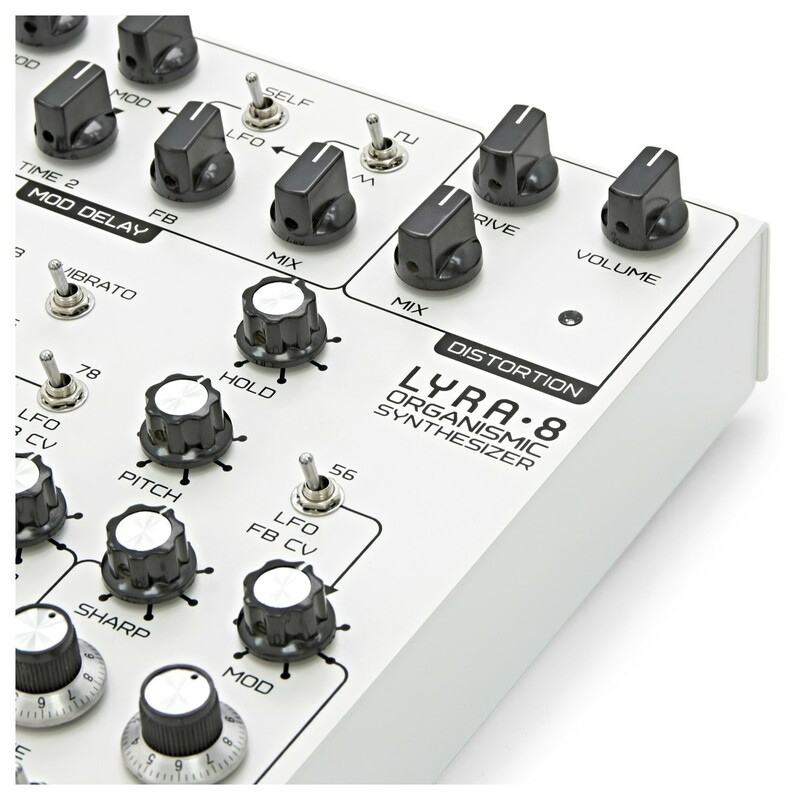 The SOMA laboratory Lyra-8 Analog Synthesizer is a unique, analog organismic synthesizer for creating drones, FX, textures, weird soundscapes and atmospheres. It offers 8 voices with built-in delay, distortion and modulation, as well as FM and vibrato, allowing for complex and diverse sounds to be created. The Lyra-8 is intertwined by many nonlinear connections and works in an entangled state to create weird sounds rather than musical. 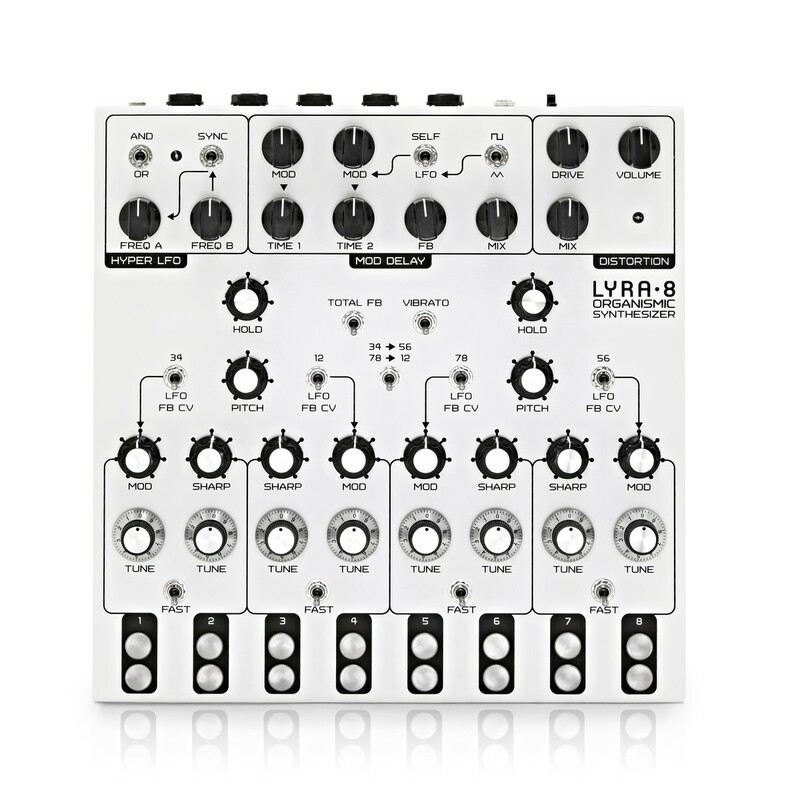 Additionally, you can use the Lyra-8's internal effects with external modules such as a drum machine. 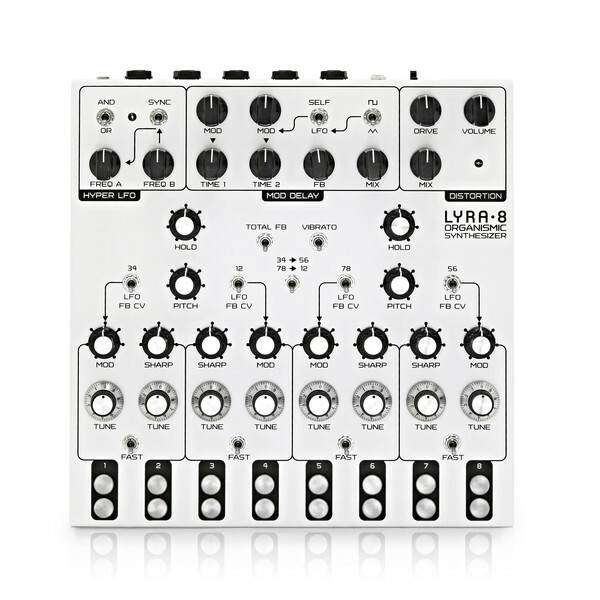 Create wild, beautiful and wonderful soundscapes with the Lyra-8 synthesizer. The SOMA Lyra-8 is not like your conventional synthesizer. 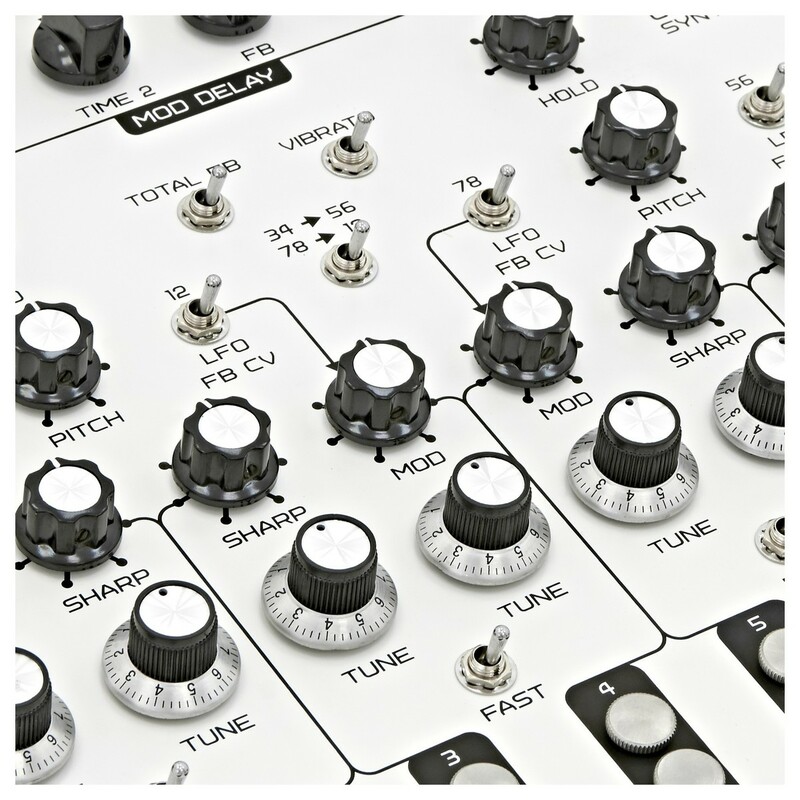 The module is intertwined by many nonlinear connections and works in an entangled state, thus allowing for the creation of many complex FX and drones rather than melodic sounds. Nothing is synced and quantised, which makes it all the better for creating drones. This is what makes the synthesizer excel at creating weird and wonderful sounds. Without numbers on knobs or presets, the Lyra-8 wants you to get straight in and delve into exploration. 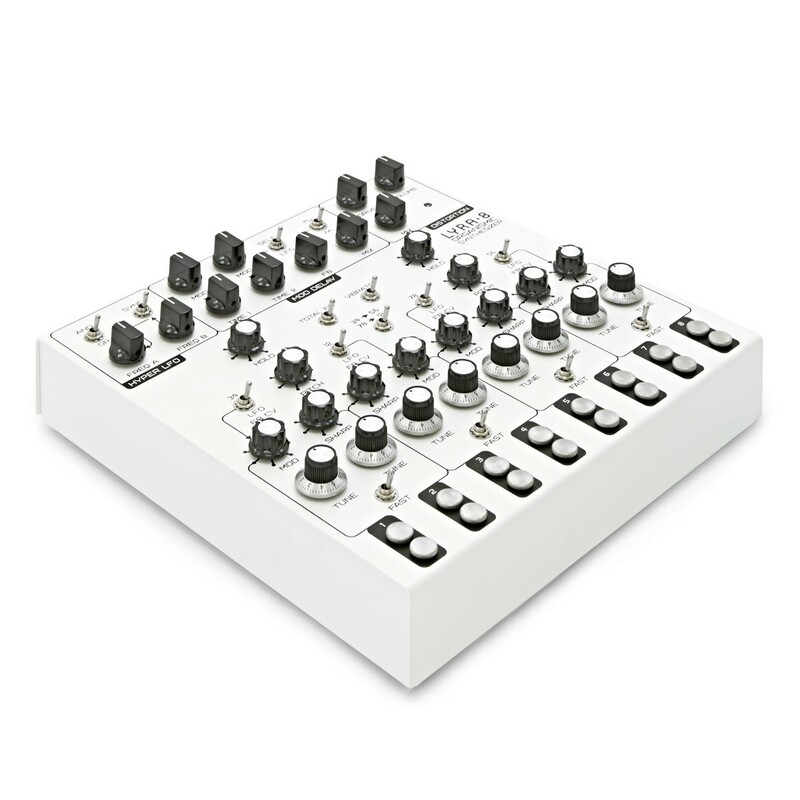 It is the ideal synthesizer for creating modulating drones, FX, atmospheres, pads, soundscapes and textures. The Lyra-8 produces a palette of darkly fractured tones. The Lyra-8 is the big sister of the Lyra-4, offering double the voices, 2 delay lines, more FM modulation, and more synthesis algorithms. On-board are 8 voices, each with their own pitch (TUNE) knob and envelope generator. There is no quantisation for the pitch, allowing you to get everywhere in between notes. Each voice also has its own modulation source selector and its own LFO that is tuned to a dedicated frequency, allowing you to avoid that primitive sinusoidal vibe you hear when only 1 LFO is used on all the voices. The SHARP knob allows you to move between a sine and triangle waveform. The HOLD knob lets you create a continuous sound and bring up the volume of all the voices, and the transpose knob allows you to set the pitch or key for the whole group. This then allows you to start adjusting other knobs whilst playing to create slowly evolving textures. Each voice has a sensor that allows you to activate the sound. Each voice also has a MOD knob that sets a selected voice pair's modulation depth with everything from sonically extreme to bright-sounding effects. The Lyra-8 also offers a range of effects designed to enhance your sound. 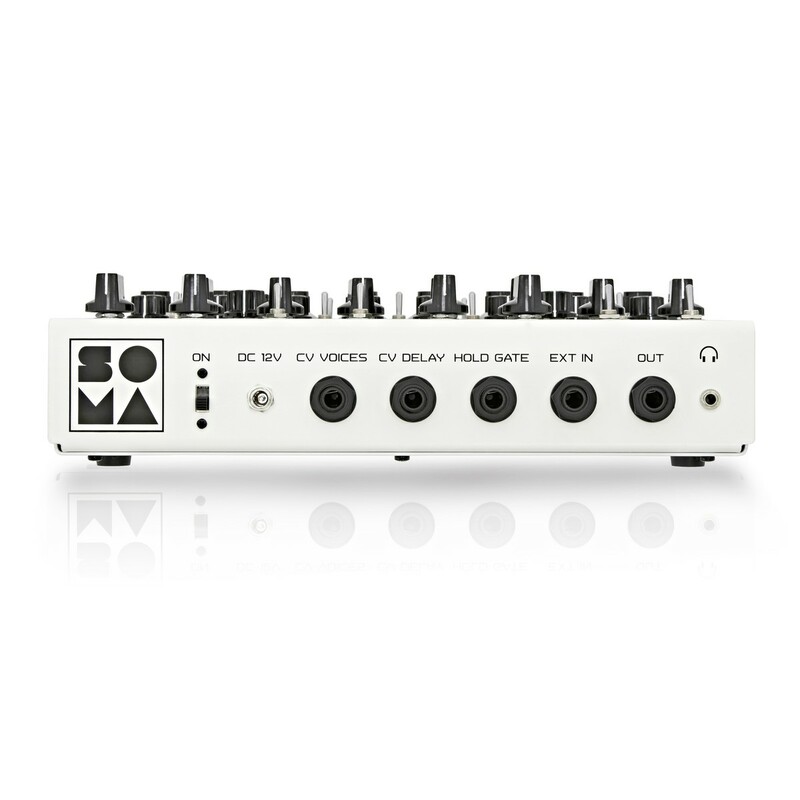 It features integrated FM, vibrato, LFO, distortion and delay. The FM is dialed in by three 4-way switches, allowing for 81 variations of FM synthesis. Each voice has its own unique vibrato frequency, as there as 8 independent vibrato generators in the instrument. The HYPER LFO consists of 2 separately tuned low-frequency oscillators, which a complex waveform can be synthesized. The Lyra-8 also features 2 independent delay channels, each with their own individual time adjustment and option of modulation. There is also a SELF/LFO switch which allows the delay time to be modulated by its own output signal, thus creating interesting FX. The distortion allows you to mangle the sound. It features a drive and mix knob for setting the required amounts. Additionally, the Lyra-8 can be used as an external effects processor. For example, you can connect a drum machine and use the effects on the Lyra-8 to add delay, distortion and LFO to the drum machine.